We took the bus on a cold, rainy January night, leaving Madrid, Spain at midnight and arriving in Porto, Portugal at 6 am. We arrived in the black of pre-dawn to a city we’d never been before that spoke a language we didn’t, and it was pouring rain. More rain than I’d seen in months. Lucky for us, the bus terminal was connected to the underground train station, so we descended the escalator into the subway. It was the first time I or my travel companion, Lisa, had seen the escalators that slowed to a crawling pace when they weren’t being used. We stood at the top of them, saying to each other “man…the escalators are really slow here in Portugal…” We received a couple of side-eyed glances from the few people that were around us, who were obviously more educated in the art of motorized stairs than we were. The escalators speed up as soon as someone steps on them (just in case you're as ignorant about escalators as we were). As always when I’m travelling, I had no internet connection while out and about, so I had pre-planned how to get to our hostel. We took the train 2 stops and got off at 24 de Agosto station. Anytime you emerge from an underground train it’s always a little disorienting, let alone when you’re in a foreign country, in the dark, in the rain. It’s confusing to come up from underground and not know exactly which street you’re on, especially when you can’t see the street names on the buildings on account of the dark and the rain. I know, I’ve already complained enough about the darkness and the rain, but it was really putting a damper on our mission (pun intended). Lisa and I ran from street corner to street corner looking for the street that would lead us to our hostel. There were about 7 corners, as we’d arrived onto some sort of heptagonal intersection that clearly only exists to cause accidents and confuse tourists. We came upon wrong street after wrong street, ducked into vending machine vestibules in between, and then finally spotted our street. We walked the block and a half to the hostel, and rang the doorbell. Nothing. Rang again. Nothing. “Do you think there’s no one there because it’s 6:30 am?” asked Lisa. “Hmm…good point….I guess I forgot to check if they had 24-hour reception”. Damn. When planning for a trip, there’s always one thing you forget, no matter how diligent you think you are. You can only hope that one thing isn’t essential, like your passport or your asthma medication or checking to see if you could get into your hostel at 6 am. We were soaking wet, freezing cold, exhausted and, worst of all, super hungry, standing on a street, just a door separating us from warmth, dryness, a bed and maybe, hopefully, a little bit of coffee. What now? Chances were there wasn’t going to be someone in reception for another couple of hours and, looking around, there was nothing open at this time of day. Just then, the door opened, and there stood a boy who was much too awake and cheery for the hour that it was. “You guys need in?” he asked. Turns out, our saviour wasn’t the person working reception. He actually didn’t even work at the hostel. He was just a traveller, same as us, but he suffered from insomnia. I’ve never been more glad for someone to suffer from such an annoying disorder. He showed us where we could put our bags and hang out on the couch until someone came to open up. He even gave us a little tour of the hostel. Great customer service. Super friendly. They really should have hired him as night reception. We peeled off our wet outer layers and made ourselves at home on the couch. We were dry and comfortable at last. No coffee, but you can’t get too greedy. It wasn’t long before someone came to open up at reception. Of course our beds weren’t ready, but she told us where we could store our bags and gave us directions to a café a block away where we could get some breakfast and coffee. “They have the best croissants you’ll ever taste” she said. On the short walk to the café we managed to find a store that sold fairly cheap umbrellas. You could tell from the way the priced was crossed out and re-written that they were cheaper before it started raining, but what can you do. We sat down in the café, and a man immediately approached us and said “café e croissant?” He knew what was up. He brought us our order, and I took a look at the “best croissant ever”. I didn’t look like any croissant I’d ever seen, so I was sure that it wouldn’t be good, as I quite liked every other croissant I’d ever had, and, you know, if it looks different it isn’t as good. I’m kidding. And wrong. Boy was I wrong. This literally was the best croissant I’d ever had, and am likely to ever have again. Just thinking about it now makes my mouth water even more than when I think about dill pickles, and my mouth waters a lot when I think about pickles. But those croissants…they practically cause a flood…okay that was gross. Sorry. After breakfast we wandered out into the rain to explore Porto. I’d heard from many travellers I’d met that Porto was something special, which is nice to hear, since a month before going I didn’t even know it existed. You’d think that I would have wondered where the birthplace of port wine was, but when it comes to alcohol my train of thought isn’t “I wonder what the where, when and who are of the story behind this beverage”. I have to agree with all the people I met who talked up Porto. They did not do it injustice (too many negatives?). Porto really is something special. The first place we wandered into was a graveyard, which I love. It had mausoleums, which I had never seen in person but are just as creepy as I imagined. We wandered into the main city, and weren’t disappointed by anything we saw. I like to call the Portuguese style of buildings “old and decrepit”. In the best way possible, of course. They’re worn out, mouldy and dirty, but I loved them. You can see their years written all over their facades, and they have a spookiness that is right up my alley. The Portuguese tiles that cover the outside of many buildings in not only Porto, but Lisbon and other cities as well are beautiful. Lots of them are blue and white, and so intricate in themselves, that when you put them all together to form the outside of a building, it’s like a work of art. If I was rich I would buy a whole factory of “azulejos” and use them on all the buildings in my kingdom. Or I would just buy all the tiled buildings in Portugal. Another reason I should have probably heard of Porto sooner, is because J.K. Rowling once lived there, and I’m a huge fan of her work. Everyone is though. Come on. No one doesn’t love Harry Potter. No one. It turns out that there’s a library in Porto which Rowling frequented and it served as inspiration for the Harry Potter series. It’s called Livraria Lello. You have to pay 3 euros to get in, and then stand in line, and of course it’s packed, especially on a rainy day, but if you buy a book they deduct that 3 euros off of the price. They mostly have books in Portugese, but they do have a small selection of books in other languages, English, German, Spanish, etc. The building is wonderful and you can see why it provided inspiration for Harry Potter. It has a huge staircase in the middle with wood railings and red carpet down the middle, and stained glass ceiling and shelves from floor to roof. It even has a nice little café on the top floor. It’s quite small, and since it’s so popular and crowded, the one thing it’s missing is that ‘quiet, peaceful bookstore’ vibe. Other than that it’s perfect. The spiral staircase inside of the "Harry Potter Library"
Another J.K. Rowling hotspot is the Majestic Café (I’m not being poetic, that’s the name of it…although it is also majestic). Lisa and I are budget travellers, and it’s a bit pricey, so we just had a tea while we were there. It’s worth going to, especially if you are stranded in the rain and don’t mind looking like a couple of out-of-place wet rats in amongst a crowd of well-off business folk, which I don’t. 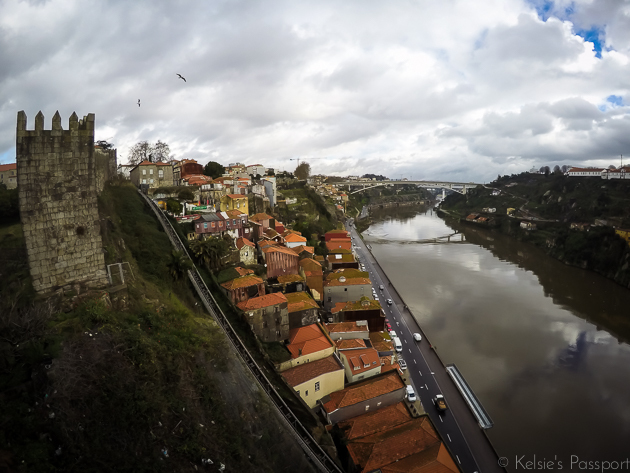 Next Lisa and I found our way onto a train bridge, which crosses the Douro river to the South side of Porto. There was a break in the rain so we stopped on the bridge and had a little picnic of pumpernickel and salami. Did I mention that Lisa is German and brings her own snacks everywhere and is the best travel companion ever? The view from the bridge was beautiful and it was nice to not have to hold umbrellas for a few minutes. We never quite made it all the way across the river to the Gaia district where you can go on port wine tasting tours, but many of the people staying in our hostel had been and highly recommended it. That’s not to say we missed out on drinking port in Porto, we just did it in our hostel and in a fashion that port aficionados would probably have frowned upon. Porto in the rain may be even more wonderful than in the sunshine (although I couldn't say for sure, as the sun never came out for more than a few seconds at a time while I was there). I love the look the water gives the tiles and the stone of the buildings. It lights up the moss, but at the same time gives the whole city a foggy, “Pet Cemetary” vibe. I loved it. We spent 2 more wonderful days wandering Porto before moving on to Nazaré, which proved to be just as amazing (actually, every place I visited in Portugal was stunning). I will be back to this beautiful city in the this beautiful country some day, and let’s hope next time I get to see it in a whole new light (and possibly in some sunshine).